Removing the guide wire at the top portion of the Sandpaper vine was not as easy as I thought. What I was seeing at the lower portion of the vine's trunk was actually the easiest part. The top part of the main trunk appears to have been tightly wound by the guide wire as shown below. But still, the guide wire could still be removed, leaving only a long indentation on the trunk. This is nothing compared to what I discovered further up the trunk. After peering through the leaves of the top foliage, I saw the junction where a couple of branches grew out. Because it was a junction, the trunk grew thicker at this point. And with guide wire was still wrapped, the vine started to "eat through" the wire itself. Pulling the wire, I knew it would cause further damage to the vine because the wire was too deep inside. So what I did is to just cut away the wire that can be removed. The rest of the wire that was embedded already in the trunk, I just left alone. I've seen this happen in a a Rangoon Creeper that totally "devoured" a portion of an insulated solid strand wire. There was no visible damage on the Rangoon Creeper and the vine continues to thrive. Removing the rest of the guide wire on the lower portion was easy enough. Here you can see the groove or canal left over by the wire. Eventually, the vine's trunk will fill this out. 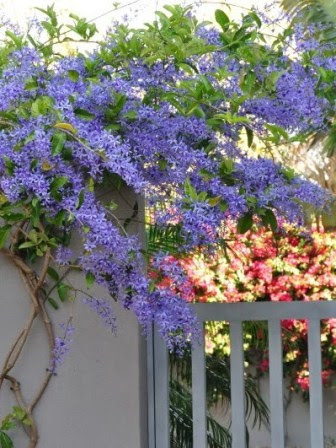 Overall, the Sandpaper vine is still healthy and is now left on its own to grow and climb on the trellis. It's a well-behaved vine compared to the Mysore Clock vine. Pruning is not very frequent and it can still actually grow more and longer branches. The homemade vine guard that I installed prevents it from climbing up the the utility pole's cables. I only need to train some of the branches occasionally, especially if the branches go over the side fence towards the neighbor's property. With its maturity, I'm hoping it would be flowering soon. I'm wishing it to be as floriferous as the one in the photo below. If the flowering becomes a success as I perceive it to be, then I will be propagating more of this beautiful vine. I've been successful thus far propagating the Sandpaper vine or Petrea volubilis through stem cuttings in a humidity chamber.